After Death Valley National Park we made our way over to Bartstow where we got a hotel room for the night. Death Valley was our last big stop of the trip. We didn’t have any destinations planned but we had places already booked to stay for our last two nights of the trip so we had time to just wander around. 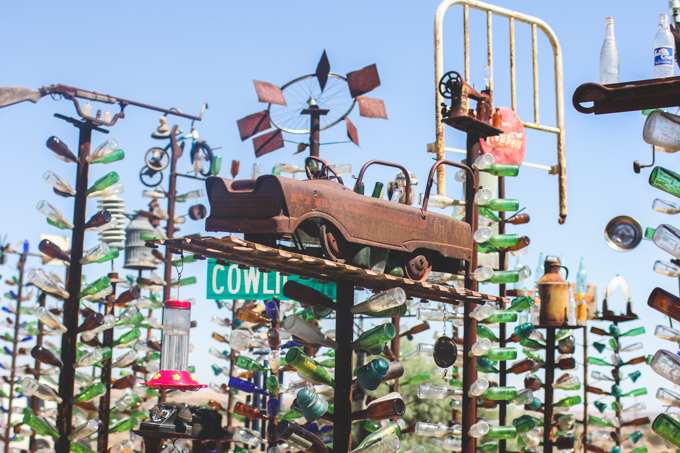 We woke up the next morning and started heading toward Bottle Tree Ranch which I had found on Roadside America while cuddled up in bed watching the Food Network in the hotel. That’s only worth noting because the Food Network and hotels go hand and hand for me. I can’t stand to watch it at home but because it’s what Jeff always turns on in hotel rooms I’ve come to love it and somehow it makes hotels feel more like home to me. So! 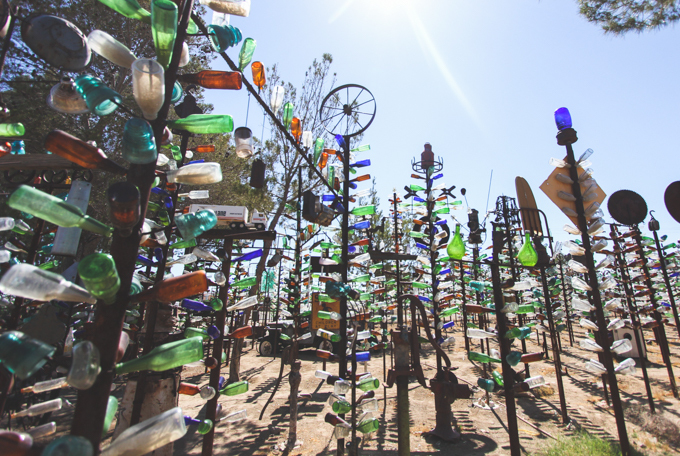 Bottle Tree Ranch. What to say about this place? First of all, WOW, it’s incredible. 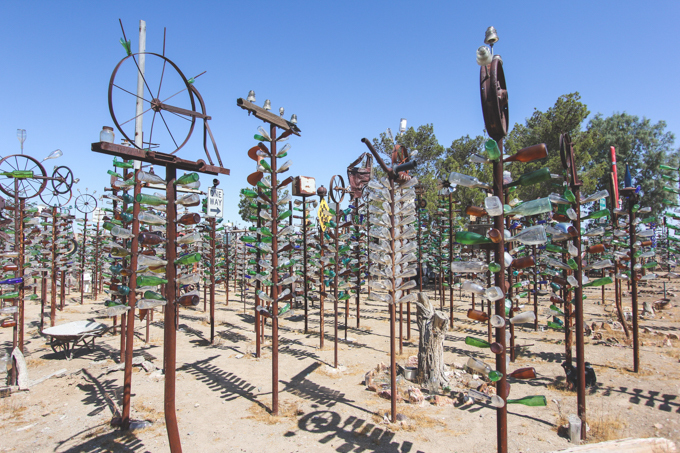 It is literally a forest made from large metal pipes with bottles on them. Elmer Long has been interested in collecting bottles since he was a kid. He and his father would go on trips where they would bring home old bottles found at dump sites. 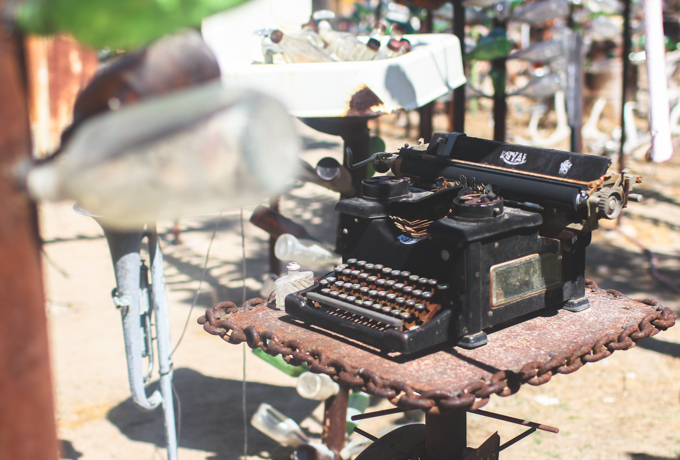 When his father died he inherited his collection of bottles and that’s when the ranch began. In 2002, at age 55, he quit his job to dedicate his time to the ranch. There are over two hundred trees and thousands of bottles! It is definitely a sight to behold. While the property isn’t all that large, it’s absolutely overwhelming standing in the middle of it all. I had no idea how to shoot it. The whole time I was just thinking “I hope some of these pictures look okay…“. I’m pretty pumped about my shots but definitely feel that there is nothing that compares to seeing the trees in person. I know when I blogged about Jerry’s Junk I briefly touched on how much I love collectors, and their collections. I just really really love passionate people. I’m the biggest weenie in the book but I’m seriously sitting here all teary eyed about this place. It’s so awesome to see people doing something they love, even if that thing is seen as a bit crazy by the general public. 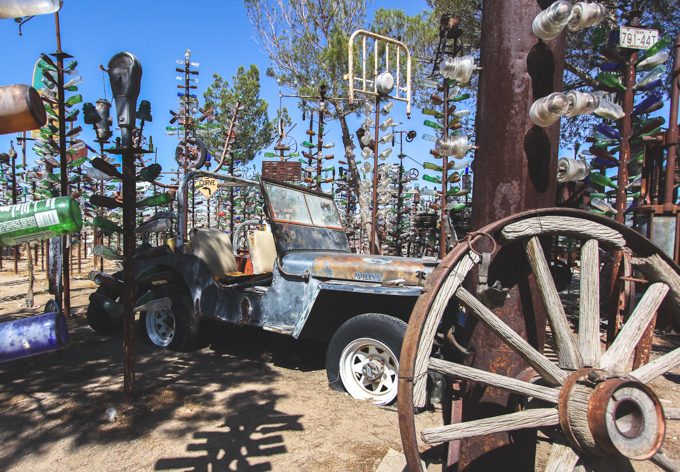 Bottle Tree Ranch is nothing short of amazing. When we visited Elmer was outside. He was so friendly and so kind. I’m so happy people like him exist! 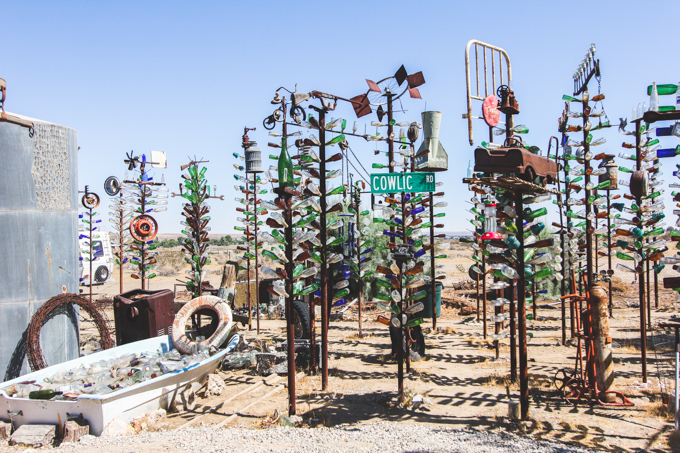 If you’re anywhere near Oro Grande, CA or are just out cruising Route 66, Bottle Tree Ranch is a must. Wow this place looks INSANE! And amazing!! This is SO cool and the pictures came out fantastic! It reminds me a bit of that scene in the Harriet the Spy movie (do you know what I'm talking about?). I love seeing all your adventures. I've never seen that movie, but a few people did mention it when I posted a photo of this place on instagram. 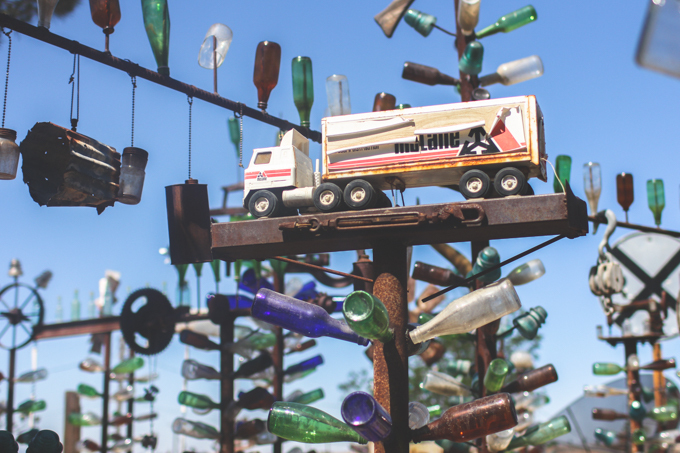 When my husband was on tour he visited Bottle Tree Ranch (and a few of your other stops!) and I've always wanted to go. I haven't properly traveled the west coast, but all your photos have sure have me wanting to! I've really enjoyed how you've broken up your trip into detailed posts of your stops! Thanks, Allison! I'm really enjoying documenting it like this, I think it'll be something awesome to look back on. I'm trying to hurry up and get all the other posts on it done so I don't forget any more little details. You definitely definitely need to get out to the west coast. I feel like we could go there on vacation every summer and still find new amazing stuff! 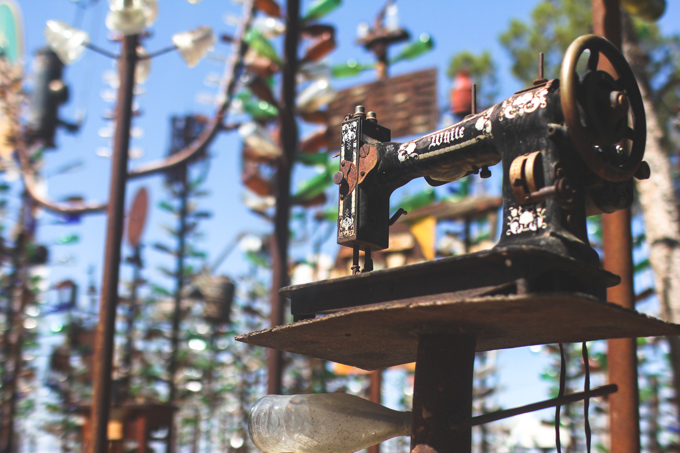 My little art space is called Bottle Tree Creative Arts House and I have been DYING to make it out west to visit Elmer and his bottle trees! 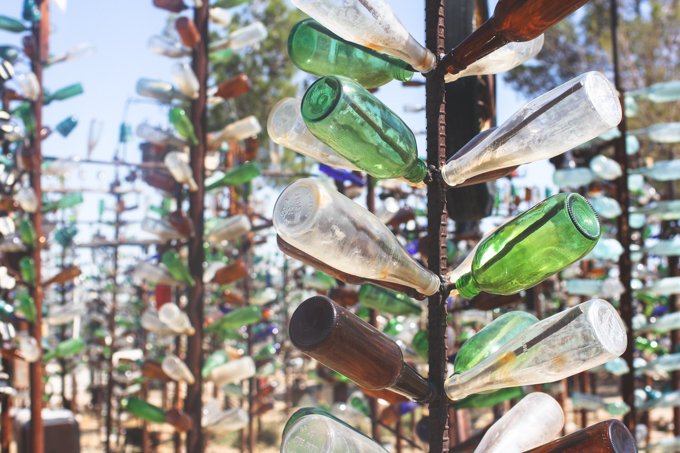 My favorite thing about bottle trees, other than they look so cool is why they're a thing. That's always been my very favorite question when people come into Bottle Tree and see my giant bottle tree mural on the wall and ask what the heck is a bottle tree. So, back in the Congo, hundreds of years ago, the native people there believed in spirits and voodoo magic and all of that stuff. They originally hung bottles from trees in an effort to catch wandering evil spirits who roam in the night and they thought cobalt blue bottles were the best color for the job! They hung these right outside their house in an effort to keep the evil spirits out of their homes. Every morning, someone checked to see if they could hear a whistling coming from the bottles, and that's how they knew a spirit was trapped in there, so they removed the bottle and threw it into the river, sending the evil spirit far away! When slaves were brought from Africa to Charleston, SC (Which is my FAVORITE PLACE IN THE WORLD!!!) they brought this tradition and that is the first place I've seen a bottle tree. The Lowcountry has so many bottle trees tucked away in yards, or next to buildings. I always get really excited seeing a bottle tree out in the wild! I love that little folklore story, and that it originated in my favorite city in America and love the message of keeping the good in your home and the bad far away even more! I had no idea there was a story behind it! That is so darn cool!!! Thank you for sharing that. 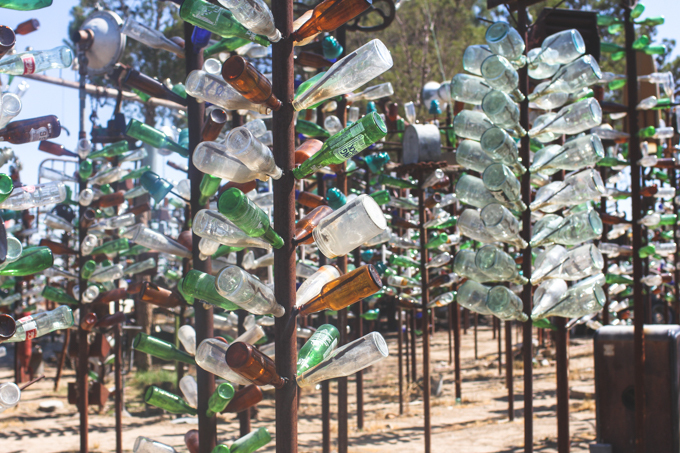 Now I really want to head down to Charleston and see some more bottle trees. definitely a really awesome spot to visit! So amazing! This is like a super organized Dead Horse Bay… I adore people like Elmer—I hope I meet him one day! There are so many places I visit and think "Alexandra would love this" and this was definitely one of them!! Wow – this looks like such a fun + cool place. I love these photos. This place looks amazing! I'd love to visit it someday. I feel the same way about people that are passionate about what they do. Its truly breath taking. Wow I am just amazed by this place. You always take such beautiful photos of unusual places and it makes me want to go to them so badly. You really have a great eye to capture the magic in your photos.